Fall is the perfect time of year for FREE home decor! It's all about the "harvest." I say step out into your backyard with fresh eyes or take the kids on a nature walk and see what you find! I found pine cones and branches for my hurricanes. It seems almost everyone has hurricanes in their homes these days - they're perfect for seasonal accents. Here I filled two with pine cones and a few leafy branches just turning in color. If you're going to snip a branch, I suggest you be on your own property or ask permission ... or be deep in the woods!! :-) Although my branch still had lots of green on it, it was laying on the ground at our local park after a rain storm, so it was available for the taking. My inspirational twist was a paper band inscribed with "with a heart of Thanksgiving." I layered stripes in my computer program and printed cream letters on them. Be sure you print it long enough to wrap around and overlap. You can also stamp letters on strips of scrapbook or construction paper. 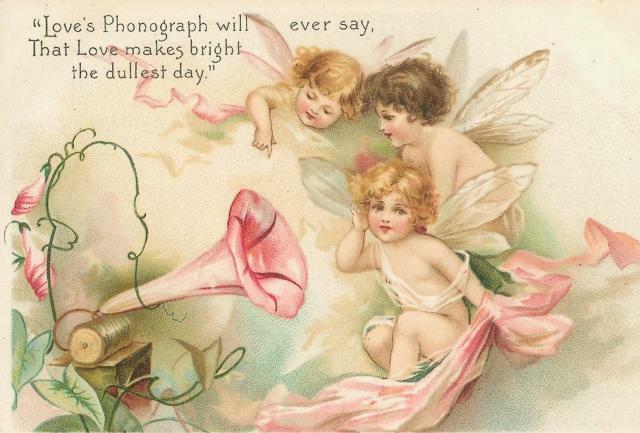 How very lovely and beautiful. I love that, how did you make those word ribbons, or did you buy them? It is such a nice finishing touch! Good question, Bella! I just added a couple sentences to my post to describe how I did the paper ribbon. Just beautiful - I'm going to do this - or at least some adaptation of it! 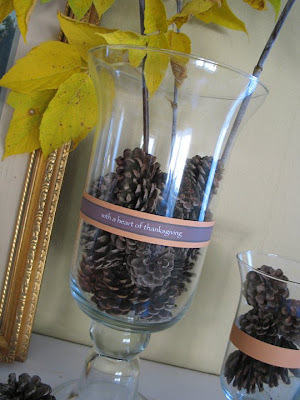 That is just beautiful...I always use pinecones in my fall decorations. I love how you use natural materials to decorate. Beautiful and cost effective, too! How long did the leaves stay on the branches? Mine are falling off rather quickly right now. Nice job! I wish the pine cones I find were shapely like yours. Mine are just not satisfactory. I love that you used what you found! I love how you used real items of nature. I personally don't care for fake flowers, leaves, etc., so I haven't done as many floral type arrangements as I would have liked just because I refuse to use fake flowers. 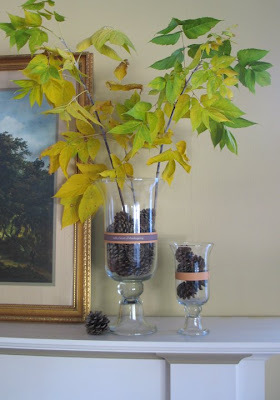 Fall is really a perfect time for natural decorations..! Its time to think about Halloween decorations also. Yes, the leaves don't stay on all that long. After they start to curl and fall off, replace the branches with some fresh cut ones. Different types of trees change at different times, so if you have a variety in your area, you could keep this arrangement going for a while! My co-worker thought I was crazy when I asked for a box-cutter so I could "harvest" some cattails on the way home from work a couple of weeks ago. I plunked them in a strawberry pot & they look great! Nature has the best decorating ideas! Simply elegant and I loved the natural look. The ribbon is so pretty!